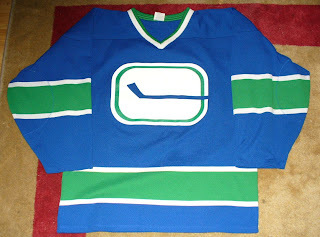 Made this blue Canucks jersey (no longer have it). Originally had Larry's Loungers screened on the front. 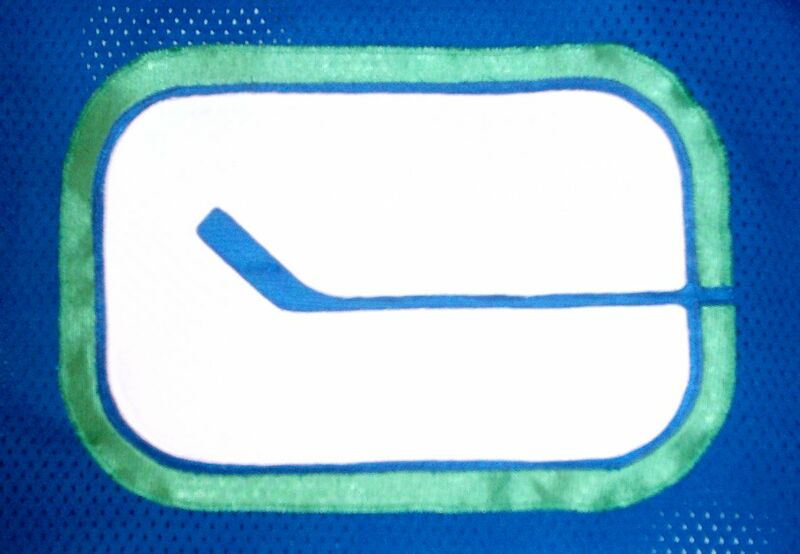 Covered that with a homemade Canucks 'stick in the rink' logo made of tackle twill. 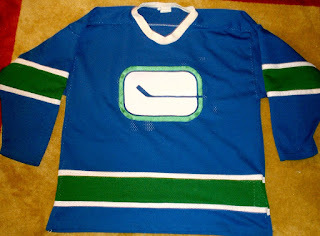 Jersey also had orange instead of green stripes originally; used some green mesh material from another jersey and my mom's serger to change that. 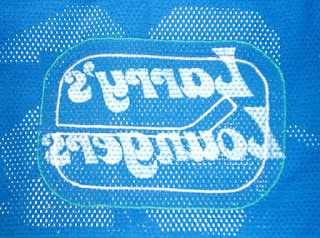 Here's a pic of the jersey, close up of the crest, and the jersey inside out to show how the crest covered the screen printing. Later got a blank uncrested black Canucks jersey from a thrift store and made the newer 'stick in the rink' as a primary logo out of tackle twill. Sold or traded that one too. 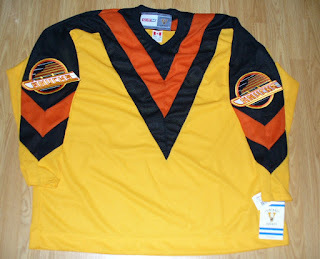 Bought one of the yellow Canucks CCM 'vintage' replica 'V' jerseys (I think from River City Sports). 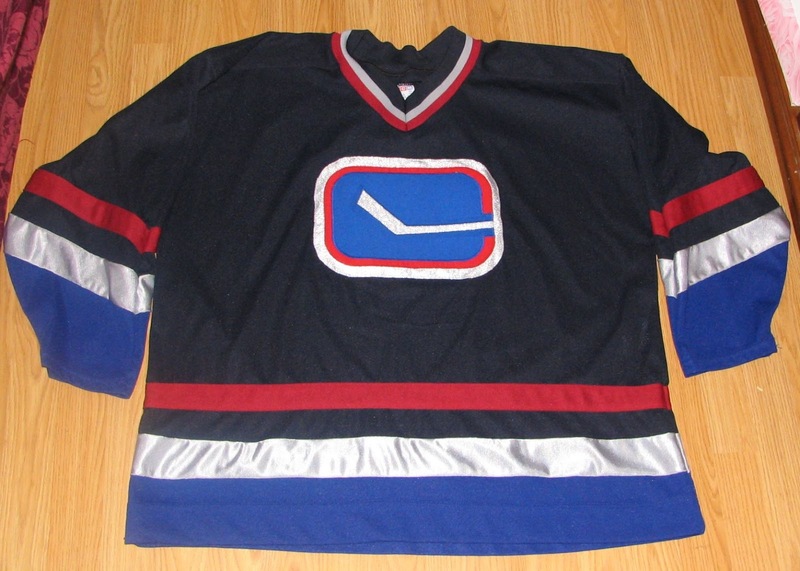 Unfortunately sold that one; too much bitching from those in 'scrub' aka 'pickup' hockey when I wore it (What are you supposed to be light or dark??). It was one of my favourites at the time (to go well against popular opinion on the 'V' jerseys). Probably should have tried to enlarge it and make it into a goal jersey; no one cares what the goalie is wearing. 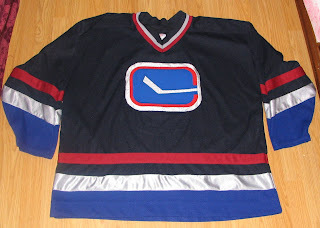 "Made" a black V Canucks jersey that I still have. Probably another thrift store purchase. Was about a size too small so I split the seams under the arms and added a couple inches of black mesh. Didn't have the arm patches so I found some on Ebay and sewed them on the arms. Most recent purchase Canucks purchase was a pair of Johnny Canucks jerseys. Someone in B.C. 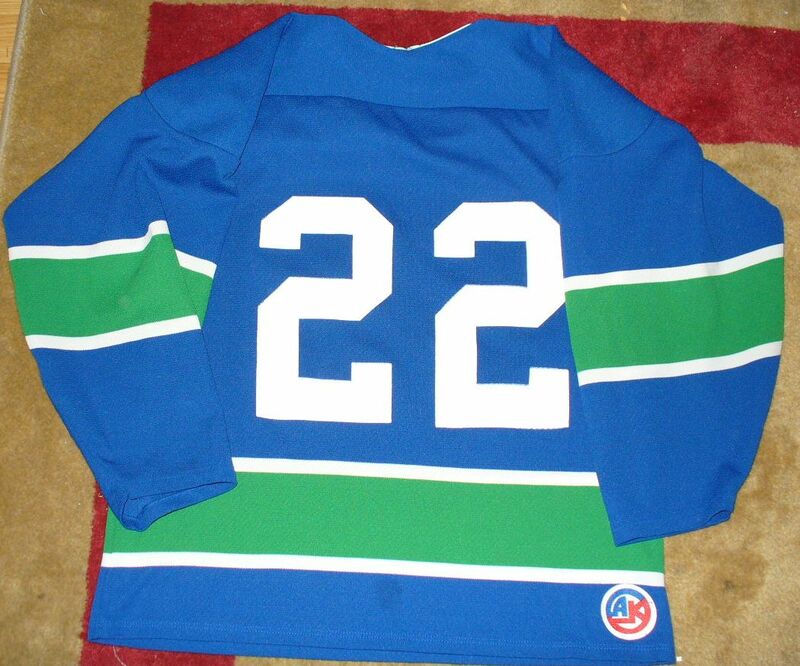 ordered at team set made up at Tally Hockey Jerseys for his Beer League team. Contacted him and he had some extras he was willing to sell - wish I had seen if he had a pair of XL instead of XXL; they are a bit big on me. The newer Athletic Knit sizing runs pretty large. 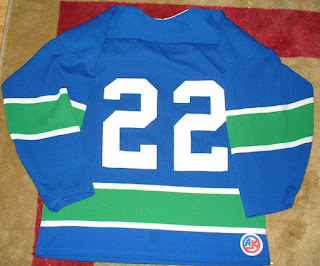 To end it, one more thrift store Canucks jersey. 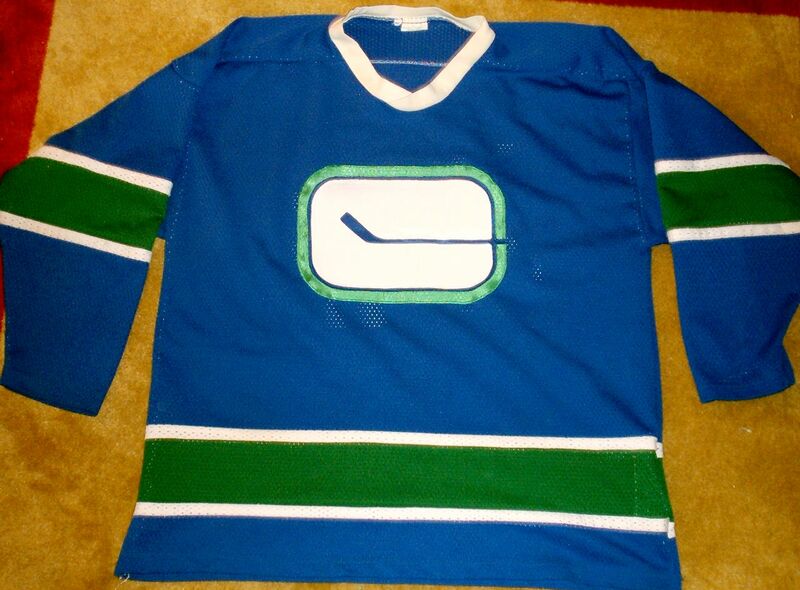 Don't wear this one on the ice as it is a size medium; just fits me to wear around as a sweatshirt. 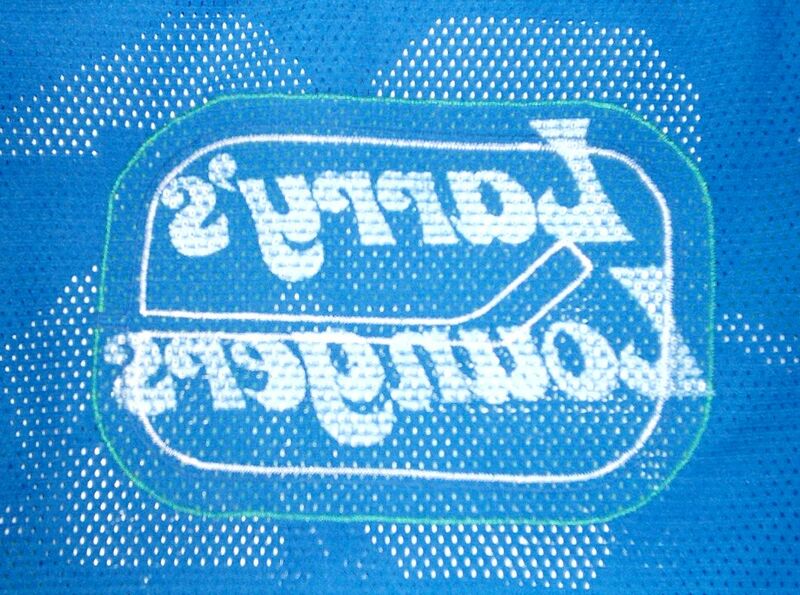 Screen printing of the crest and numbers has a rubberized feel to it. Wow! Love the homemade jerseys! 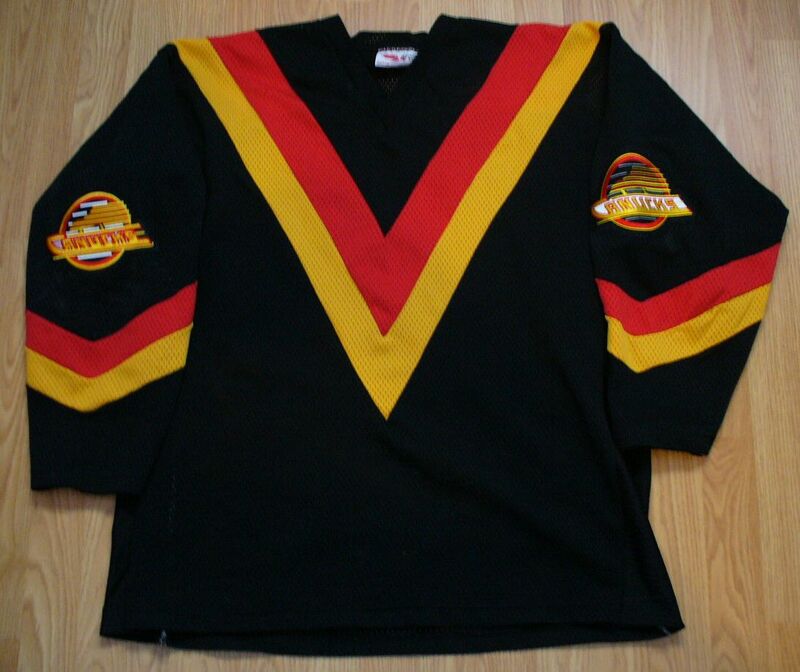 That black Canucks jersey is awesome!